One of the most thought-provoking days I had last year was the dconstruct conference in Brighton. Peter Merholz's brilliant presentation about experience design had me thinking then and it has me thinking now. One of the stories at the heart of the presentation was about the way George Eastman reinvented photography with Kodak by massively simplifying the photographic process (as far as the customer was concerned). 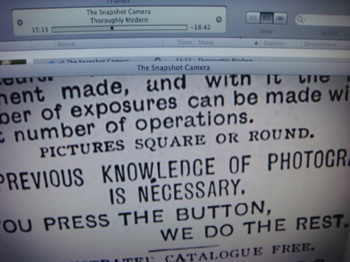 Unlike the messy and complicated procedure that had gone before would-be photographers only had to "Pull the Cord (to prepare the shutter), Turn the Key (to advance the film), and Press the Button (to release the shutter)". Mr Merholz is completely right about the way Eastman achieved so much by conceiving of what he was doing as a service rather than a product. Brilliant stuff. And an example to learn from. But I think it's also worth looking at the way Eastman used advertising as 'pre-experience design'. Whenever I mention this idea of 'advertising as pre-experience design' to actual designers they mention the Apple iPhone ads, and praise them for using advertising to teach people how to use the product, how to point and pinch etc. And this is certainly admirable. But it's also a universal truth that people think that the thing they do should be the thing that the advertising's about. And I think the genius of these ads is a bit more subtle. Other phone manufacturers will tell you that doing the stuff you need on their phone is objectively, measurably just as quick as on an iPhone, but that people report the iPhone is quicker. I suspect quite a lot of that is because the music on the ads makes the pace the iPhone moves at just feel right. The ads are a component in the experience, they provide an implicit soundtrack to your experience. 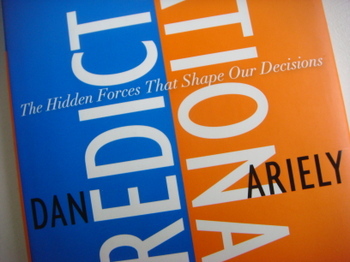 Reading Dan Ariely's Preditably Irrational made me think about this all over again. He tells of a number of experiments which illustrate the effect expectations have on experiences. Coffee served with fancy condiment dispensers nearby is reported as tasting better than the same coffee served next to tatty condiments. The price you pay for a drug alters it's efficacy. If you want people to enjoy the wine you serve you're better off investing in elegant glasses than decent wine. This is not new news. This is just how the brain works. Our feelings, our 'experience of experiences' is shaped by our expectations and it would sensible, if we're trying to create great experiences, that we align the expectations to help the case we want to make. So far, I suspect, so obvious. The problem is, I bet it's not happening. I bet there's not a decent-sized corporation anywhere that enables process and experience designers to collaborate on 'expectation design' with marketing and communications people. It just doesn't work like that. This ad is a gorgeous example of 'pre-experience design', seeing this will alter your experience of driving a Golf at night. Yet I would be absolutely staggered if the creators of the ad had collaborated with, or even seriously talked to the creators of the vehicle about night-driving. But imagine what they could have done if they had. Imagine the lovely little touches you could have added to the ownership experience if you'd known about this music, those words, this idea. Imagine if they didn't think of it as advertising but thought of it as the ownership experience stretching out in time and media. Ah well. Anyway. You get the idea. I guess it seems a bit ambitious to ask practitioners in an emergent field to suddenly take on responsibility for marketing and strategy and all that colossal headache but I'm convinced that some sort of Experience Design will become the master discipline for businesses that want to be good at selling stuff. It would be a shame if that didn't happen, if they got stuck in the same corporate process silos as everyone else. Another fantastic post - you're on a roll today! I wonder if you could trigger some kind or 'rewards', easter egg style, if people saw the work and then bought the thing. Clearly, you've taken it a step further here. My company is currently working on a project where we might be able to do what you talk about here... It's with a startup that is launching a product in the consumer electronics space. I suspect it is only startups who have this opportunity to really bring it all together -- when I worked at Epinions, I sat in meetings with Goodby/Silverstein as we planned our ad campaign, making sure it tied together with our product work meaningfully. Same can be said of the Coke Happiness Factory stuff. They've chosen the put-coin-in-vending machine moment to be at the beginning of their ad - a moment that we all physically share when we use one of their machines. And even though I know the machine is made up for moving metal bits, my mind does drift and think about colourful rainbows and funky animals every time I buy from a machine. Brilliant. The best marketing has always been about pre-experience design, but great marketing is rare because the majority of business people know nothing about the power of art and its emotional affect on human experience. The good news: that makes it easier for those of us who do!